So this post is going to be a little different than my typical post. For those that have pen pals or who have friends or family that they enjoy writing handwritten notes to, you might find this helpful if you find that folding up your letter and sealing it in an regular old envelope is a tad boring, and you'd like to spice things up a bit. 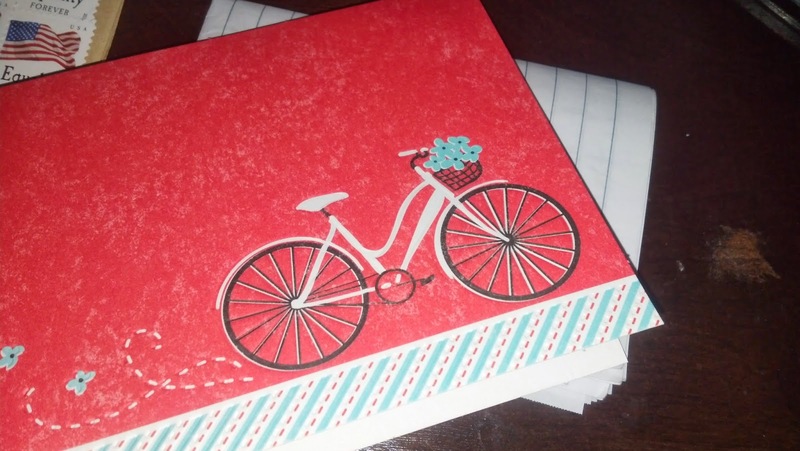 I like to get creative when I send things out in the mail, and in this post I am going to show you just a few of the ways in which I put together a letter when I'm sending it out to somebody. 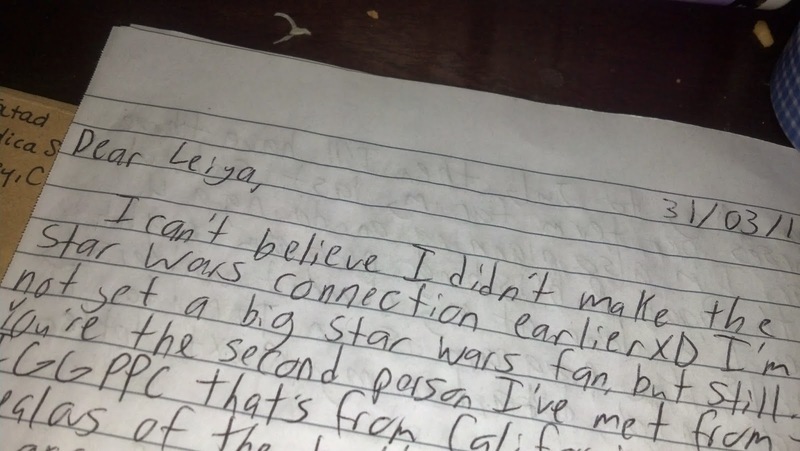 For this post, I'll show you how I prepared my letter for my 2nd and newest pen pal, Leiya. 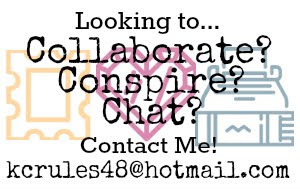 Instead of listing things you may need here, like a typical how-to post might do, I'm going to bold and underline the items I use as I go along, since there's no specific formula for putting together something to go with your letter. I'll also be naming specific brands of items that I use, but really anything you find might work, whether you're shopping for stationary items at Michael's, Target or your local dollar store. First off, I can't stress this enough, if you really want to wow your recipient than you should think of sticking your letter in some sort of note card. You can get specific ones for birthdays or as thank you notes, but it's easy to get a box of blank note cards as well, which I primarily use. The design covering the first picture on the left is from a set of 8 identical blank note cards that I picked up at Target, the design is from Carlton Cards. Another benefit of using note cards is that they come watch matching envelopes, which are not only the perfect size for what you're sending but are also typically colourful, depending on the note card set you buy. It's also nice to decorate your note card, as well as your envelope. Think of both as a blank canvas that you can decorate, and you can even choose to overload them with decorations if you'd like and they would still look great. 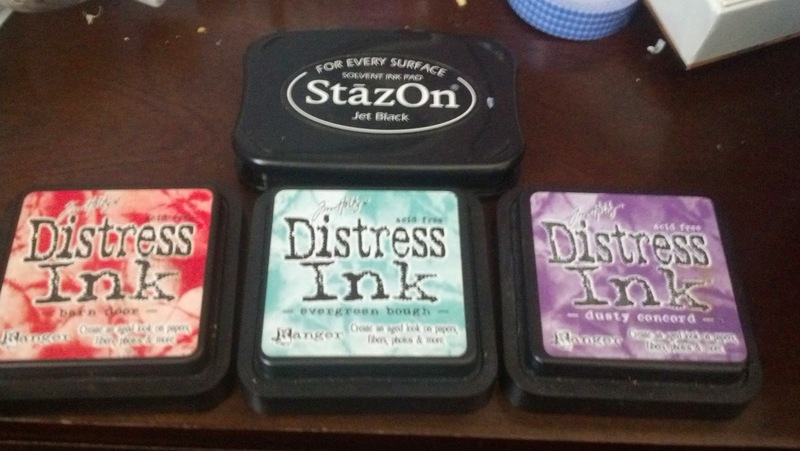 I typically choose to use ink stamps. Truthfully they;re not hard to use, you just have an acrylic block and some rubber stamps, and they're not too messy to use either. For the ink in this particular parcel, I chose to use the Jet Black StazOn ink pad from Tsukineko, and three shades of Jim Holtz Distress Ink from Ranger Ink, the colours being Barn Door, Evergreen Bough & Dusty Condord. I really like using these Distress Inks because depending on how much ink you load onto your stamps, the ink will created an old-fashioned, aged effect for your stamp once it's applied to your paper. For the specific stamps that I used, I chose to spell out the word "Hey" using the "Mindy's Alphas by Mindy Terasawa" clear stamps from Autumn Leaves, and I used a different distress ink for each letter. On the bottom-right corner, I used a simple corner stamp to give the card a little bit of a flourish, using one of the "Heather Bailey Decorative Corners" by Freshcut. One thing I insist that you do, even if you're sending a full-length letter to somebody along with this card, is that you write a message on the card itself. 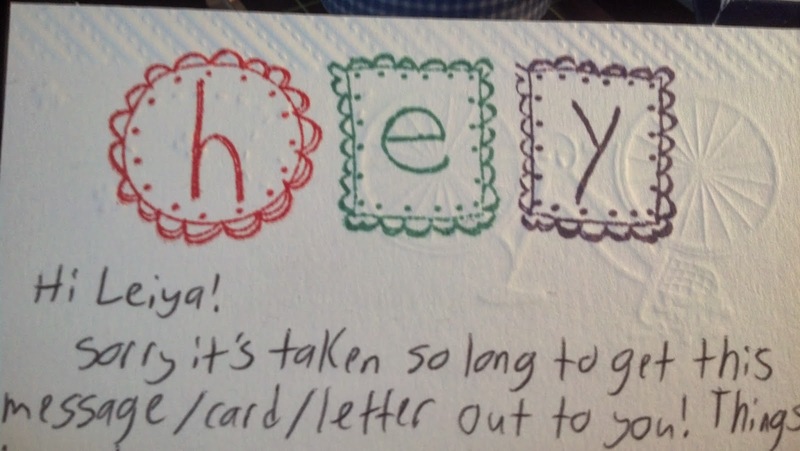 It doesn't even have to be on both halves of the card like I did; you could write a short message on one half, and fully decorate the other half. The only reason I included a longer message in the card is because my pen pal did the same thing for me (plus I wanted to apologize for taking so long in getting this letter sent out to her). Stamps is obviously one way to go when decorating the inside of a card, but you don't have to leave it at that. You can always use stickers, glitter or confetti inside your card as well. Paper confetti is super easy to make with the purchase of some sort of paper punch in the shape of anything from a butterfly to a heart, even a pencil shape! If you're a geeky pen pal, now would be a good time to load up on using some great geeky stickers! I have a Digimon & Pokemon set that I like to use personally, but anything will do. You may also choose to include some sort of gift with your letter, although it's not a requirement. 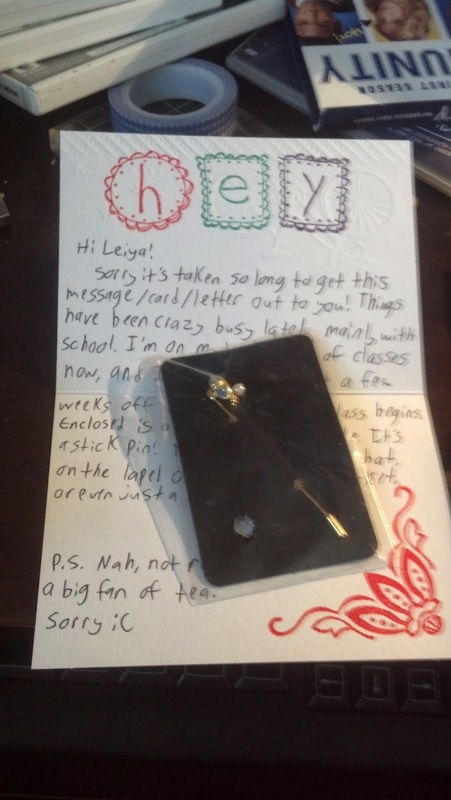 I sent my pen pal a jewelry sample along with my letter, and you can see the stick pin I sent her in the picture. Now, if you are going to send a gift, proceed with caution! If the envelope you send out is too thick, there is a chance that your local postal service will send the parcel back to you because you need to include additional postage. This happened to be in December when I was sending my fellow vlogiggles Christmas cards which also included not one but two jewelry samples each. For some ideas on gifts that you can include that will be appreciated but won't have you shelling out extra postal fees, try sending out a sheet of stickers! I tend to do this a lot, and I'm always ecstatic when somebody sends stickers to me, and I always end up using them on other letters. If you have an artistic side, you could always draw your pen pal a picture of sorts to send them as well. My first pen pal Diana is extremely talented, and whenever she takes the time to draw something for me I am extremely grateful. I sometimes either send a bunch of scented stickers, or use them on my cards or envelopes. These stickers can be a lot of fun, but make sure not to use too many, or you could leave your recipient feeling nauseated because of the powerful smell that comes with your parcel. So if you do decide to send out a gift with your letter, be careful of its sizing. 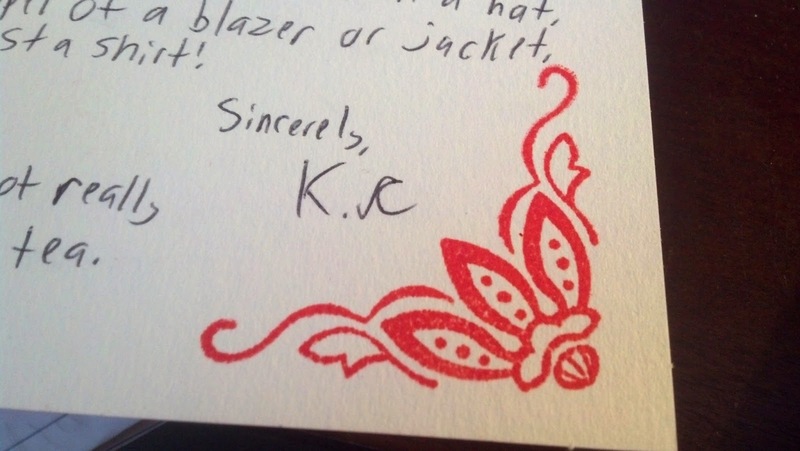 One thing I typically include with letters, although it's not typically a gift, is a black insert with my initials, KC, in cursive made out of scrapbook paper. My mother made them for me using her Cricut machine and gave me a whole whack of them as part of my birthday present last year. 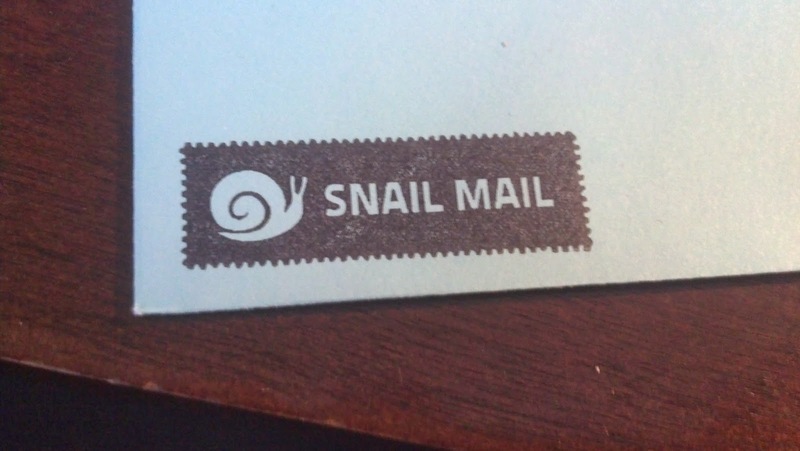 It's always nice to personalize your letters with something nifty like that, and something like that is both so simple and so easy to make, yet it will leave the mail you send out with a personalized feel. Next comes another fun part of sending something in the mail, which is decorating the envelope! 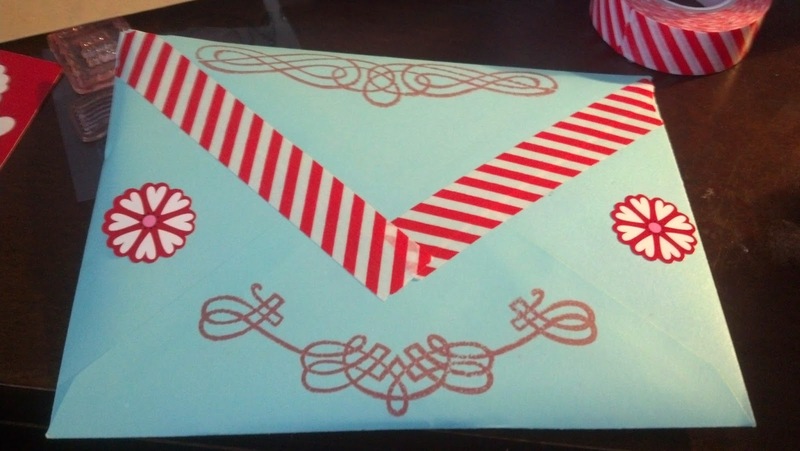 Even if the envelope that you're sending out is a funky colour or has some sort of decorative design o it, I always recommend that you put in a little effort into making the envelope look nice as well. First off, while this may seem like a common sense move, it's easier to do any work with your envelope before you seal your card & letter inside. More often than not I forget to do that, and so my envelope decoration will be sloppy XP Secondly, you don't need any sort of personalized address sticker, but if you would like one to use with everything you send, they're easy & cheap to make using Microsoft Word. Of course if you don't feel particularly creative, there are numerous shops on Etsy you can go to where they will create custom address stickers for you with your specifications. 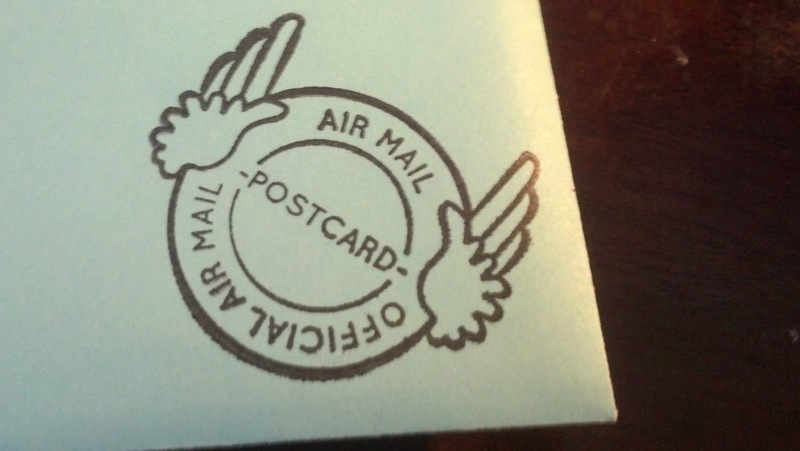 For the front of the envelope (which should never be neglected), I used my Snail mail stamp (which I adore!) that I purchased from Wit & Whistle. I also used a couple of stamps that came with a small postal-themed pack from Studio G.
One helpful hint that I wish to impart is that for your writing of your letter, your card, and on your envelope, use black ink! I read an article written by a mail carrier a while back that shared the fact that when it rains, blue ink will run a lot more than black ink will. So that's definitely something to take into account. Here is my finished product! Using the same Barn Door distress ink, I included some nice swirly stamps from Prima Hybrid. Unfortunately, I didn't line up the top stamp correctly, so it's a little crooked XP Never fear though! None of this is about perfection, and I doubt my pen pal will be befuddled by my lack of spacial alignment. One thing that I think always helps a letter to truly pop is when you include washy tape along where the envelope has been sealed. This is of course done once you've sealed your card and letter and whatever else inside. You can get washy tape pretty much anywhere. Typically I use tape sets that I picked up at the Dollarama near my house, but this one in the picture I picked up at Wal-Mart around Christmas time. Those flower stickers on the envelope were gifted to me by a fellow iggle during the Valentine's Card Swap. and she has a whole whack of supplies in her craft room that I have access to. A lot of these things can be purchased cheaply or even homemade if you're feeling so inclined. If you are interesting in looking up the products used in this post, I provided as many links as I could, and where I couldn't find links I made sure to include all the information about the products if you wanted to look up the product yourself. Please tell me about your experiences with sending letters, or if you have any other advice/tips/tricks to share, in the comments below! I wish I had read this before the letter I sent today went in the mail, augh! So many good ideas here.